If ever an employee comes back after being archived (see here how to do so) and needs to be scheduled, instead of "re-creating" him, it is possible to reactivate his account with all his information saved! 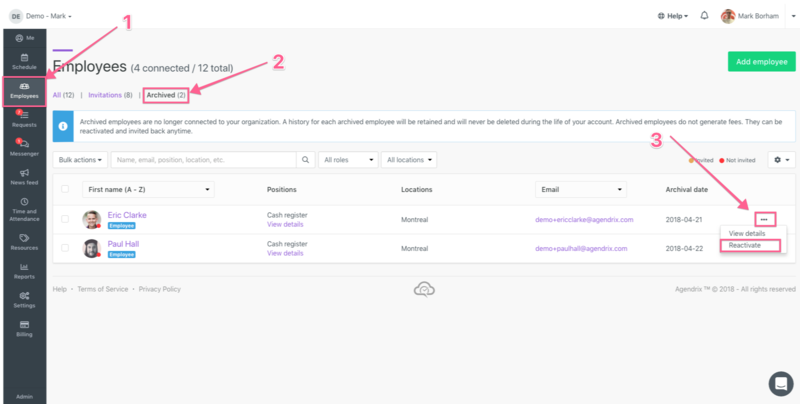 Find the employee in the list and click on Reactivate under the 3 dots. Note : The moment an employee is reactivated, he gains access to your Agendrix organisation as his previous Agendrix role. He will also be billed as soon as the next billing date.